Okie peeps, that's Sukma and Salmiah! How we know each other?? We know each other through phone calls. We've known each other for quite long, I mean as in months. One afternoon, Sukma called me and asking me to come out for a drink. Of course am quite surprised with that! Salmiah came to my office before and yea she met me before. I didn't know that Sukma and Salmiah is best friend! They are both from different companies, so why would I expect that? Sukma asked me to join them and Salmiah fetched me up after work. So, we then headed to KFC and *gosh*, we had a long chit chat!! For those who's been following my blog since long time ago, sure you guys know that they're certain colleagues kept on giving me problems! I've been trying to ignore them all this while and yea they just won't stop it. I just know that they start spreading stupid rumors and funny thing is they didn't know that they are just humiliating themselves for doing so? So, I prefer not to give a damn on it. It's not like I can zip off your mouth. I pissed off but yea I know much more people loving me as I am so LOVABLE!! 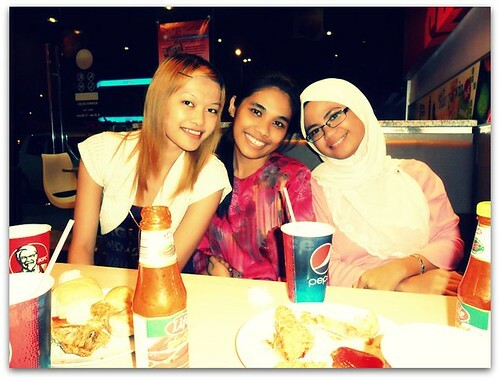 wah best ah make new friends.. and they look so friendly lah..
of coz only applicable to me...wahahahahaha XD love you!! wah.. too mush sweet thing, later can get diabetic. bulu roma dah berdiri. Bully usually enjoy response of their victim. When no response, bullies will quit bully the victim. so lovable. even client can be best friend~. if only my client is like your client. @Eric Lee ish cannot become FC then blame the internet connection pula! tsk!!tsk!! heee sure la! <3 u too! WHAT??? You have a hubby already? *I think I go and kill myself now... Sobs! Bye-bye, cruel world! LOL!!! I've only just recently met you from some of the same friends we have in common that commented here. I can tell you are lovable(and pretty) indeed. Like the cliche goes: Haters are confused admirers who can't understand why people love you. You're so LOVABLE that I have to say I love you! LOL! phone call also can make temujanji to go out for drink....next time i call u to kl...come ere for drink with me yeah...hehehe. Thank goodness I am working from home, no nasty colleagues to get on my nerves! :) Happy Monday sweetie! Wow, you clicked even though it's your first time to meet in person. That's nice! @Q Smith hey thnx for dropping by! :D thnx for the compliment!! hahaha...sure sure...u teman n entertain him while me and yve makan dinner...hahaha. Fun Time with Abby and Kevin! Sis Haylie is finally 1 year old!